Search.seemoviesonline.stream is a product of ChumSearch. It might seem to be an ordinary search provider at first sight, but research has shown that it is far from a reputable search engine. 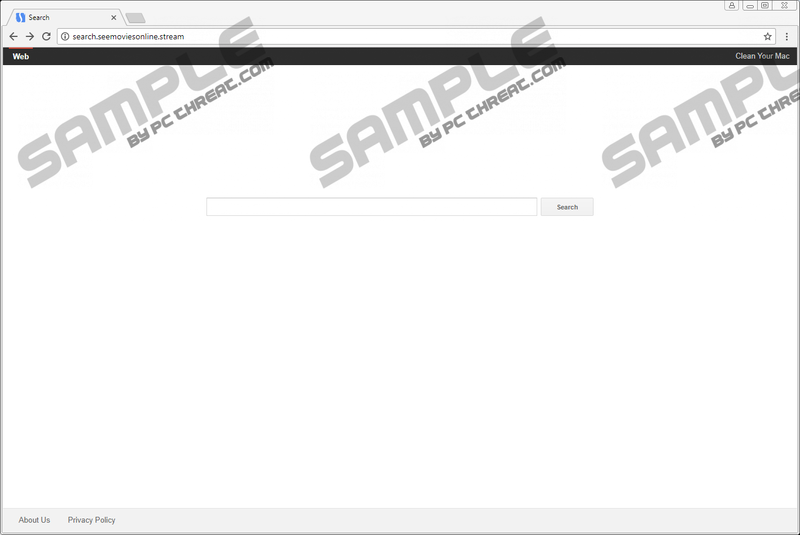 It is a typical browser hijacker, specialists working at pcthreat.com say. It has turned out that it does not affect computers with the Windows OS. It only affects MAC computers. Even though the installation of browser hijackers is usually silent, it is impossible not to notice their appearance because they change browsers’ settings right away. As for the Search.seemoviesonline.stream browser hijacker, it should affect Mozilla Firefox, Google Chrome, and Safari browsers. It should only change homepages and default search tools on these browsers, but some users might find other browsers’ settings altered too. If you immediately see Search.seemoviesonline.stream when you open any of your browsers too, there is no doubt that you have already encountered the browser hijacker. Do not use this search tool to perform web searches because it is not a fully reliable search provider. Additionally, our security specialists want to warn you that it might even expose you to potential threats. Read the rest of this report to find more about this search tool. At first glance, Search.seemoviesonline.stream looks like an ordinary search provider. Unfortunately, it is the opposite, so you should not perform web searches with it. Search tools that appear on users’ browsers out of the blue are never trustworthy, so if a new page that looks like a decent search provider is ever set on your browsers, go to eliminate it without further consideration. In most cases, search tools promoted by browser hijackers show untrustworthy search results. Search.seemoviesonline.stream is no exception. It is very likely that you will see some modified search results if you use it to search for the information on the web. It is quite hard to notice these search results because they do not differ much from those ordinary ones. As a consequence, if they are displayed to you, you will eventually click on them. In the worst-case scenario, you might even be taken to a dubious website. Of course, we do not try to say here that all modified search results open suspicious websites, but it is definitely one of the main reasons you should not use Search.seemoviesonline.stream to perform web searches. It has also turned out that Search.seemoviesonline.stream automatically collects certain details about users. Speaking specifically, it records technical information about the user’s device, usage-related information, e.g. web pages users visit and the content they see, users’ interactions on social networks, and registration-related information. It might disclose this information to third-parties, e.g. content providers and advertising networks. There is only one thing you can do to put an end to this activity it performs – remove Search.seemoviesonline.stream completely from all affected browsers. Browser hijackers are such threats that usually illegally slither onto users’ computers and then immediately change all browsers’ settings without permission. Our researchers say that they are usually spread bundled. That is, they travel together with other programs, so they enter systems unnoticed quite easily. If you have noticed your browsers’ settings changed after installing new software from the web, it means that you have also installed the entire software bundle containing the browser hijacker. These threats are relatively sneaky infections, so it is not always very easy to prevent them from entering the system. Luckily, there is one way to ensure the system’s maximum protection easily – enable a security application on your computer. As long as it stays active on your system and gets updates periodically, untrustworthy software could not enter your system and make unauthorized changes. You should not use Search.seemoviesonline.stream to perform web searches. If we have convinced you not to use it, there is no point in keeping set as your homepage/default search tool either. You should be able to eliminate it from your browsers by resetting them all to their default settings. You will need to put some effort into the manual Search.seemoviesonline.stream removal, especially if you use Safari, but you should be able to get rid of it yourself if you use our instructions (find them right below this article). Alternatively, you can remove the browser hijacker and thus undo all undesirable modifications it has made by scanning your system with an automated scanner. Click the menu button (top-right corner) and click Help. Open Google Chrome and access its main menu. Click Advanced at the bottom to open the rest of the menu. Click Go at the top. Press and hold the Option key until Library shows up. Locate the Safari folder and move it to your Desktop. Open the folder named Saved Application State. Remove all instances of com.apple.Safari. In the Cookies folder, find com.apple.Safari.SafeBrowsing.binarycookies and send it to Trash. Eliminate all files with com.apple.Safari. Quick & tested solution for Search.seemoviesonline.stream removal.